The Pärnu Central Library building was designed by 3+1 architects Markus Kaasik, Andres Ojari and Ilmar Valdur. The library is situated in a central square in the city of Pärnu, next to a 1960s theatre building and close to the city's 17th-century fortifications. Library is framed by a different view from each direction. 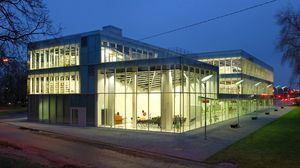 In order to link it to its context, the all-glass building has a smaller plaza in front that leads to the entrance; the outside space is continued inside the building and transparent walls allow for visual continuity between them. The interior is arranged largely as an undivided continuum that serves to reinforce the idea of a single coherent space extending through the library from the theatre square to the edge of the old town. As the city of Pärnu is a popular summer resort, the building has to meet not only year-round local requirements, but also cater for the interests of large visiting public. In addition to designated reading areas, the library is equipped with conference rooms, exhibition spaces and cosy coffee corner. ("4dsocial : Interactive Design Environments, 2007). The architects of 3+1 are the laureates of annual architectural prize of the Cultural Endowment of Estonia 2008 for designing Pärnu Central Library's building. Iga kuu viimasel reedel on raamatukogud suletud.